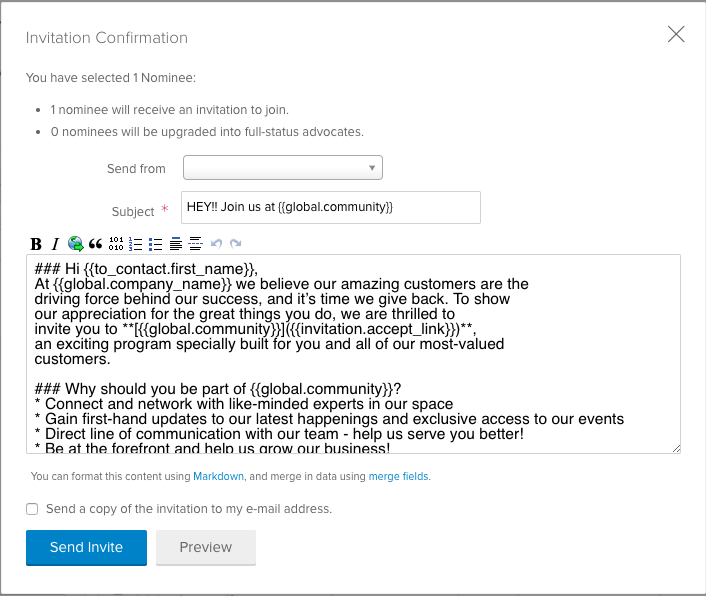 Sending an Invite URL is the easiest way to invite advocates to a group. 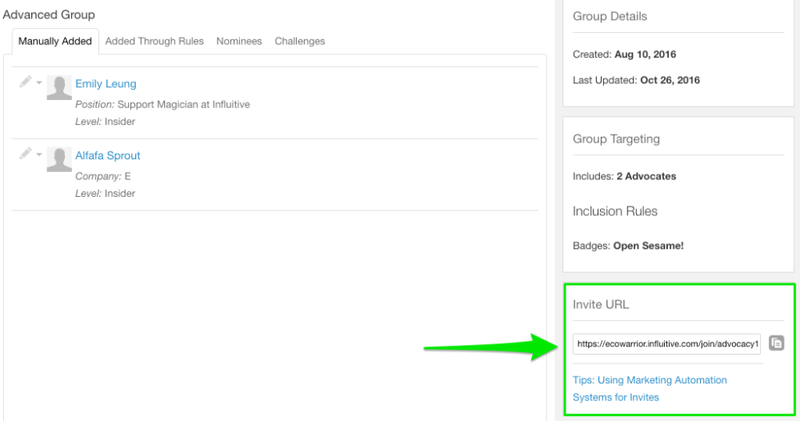 The codes for Invite URLs are made when creating groups. The Invite URL can also be found on the bottom-right corner of the Group page, where it can be edited as well as copy and pasted for sharing. 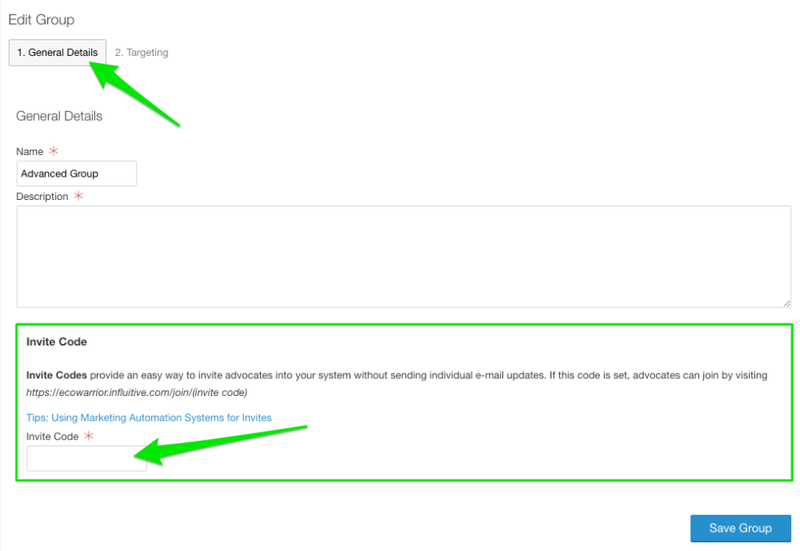 If you choose to import/ add your nominees using the built in features of AdvocateHub, there are two options available to you. You can import a list of advocates using the Import feature or, if you are going to be more selective, you may chose to input the names of your advocates one by one. Let's look at both options below. 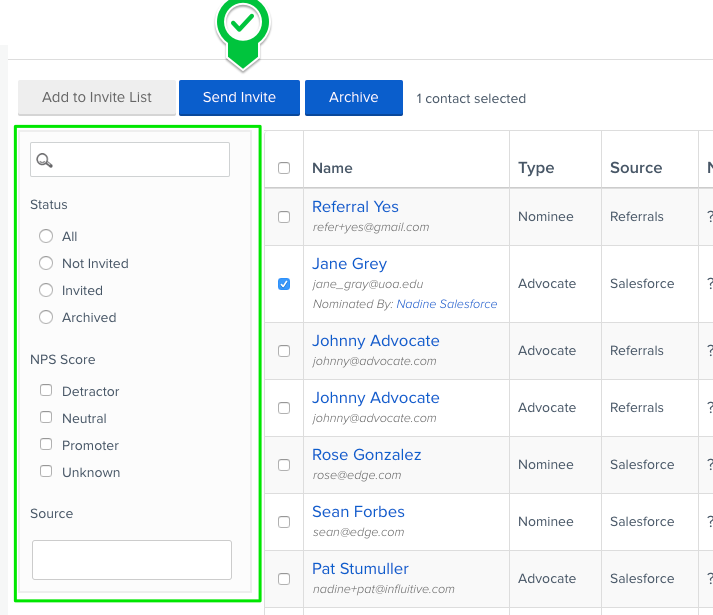 To individually input names, select Advocates from the Admin view, Actions button and then select Invite Contacts. You'll then be directed to a Invite Contacts page. To add people to this list, select Add a new Nominee. A pop-up window will appear. Fill out the form with all the information that you have. There are only a few required fields – Email and Name. You can further customize their advocate profile by selecting Advanced on the form. When you've filled out the form, select Add Advocates to return to the previous screen. From there, select the contacts that you would like to invite into your AdvocateHub by checking the box beside their name and select Invite & Upgrade. You can use the filters on the left-hand side of the screen to narrow down your list of nominees. If you’d like to invite a group of advocates, you can use our import feature. When you do this, all of the advocates that you import will be added to your list of advocates. They will not be added to your list of nominees. You can choose to email them during the import feature, or, after the import is complete. You can also email them separately with a Group Join Code URL for your AdvocateHub. 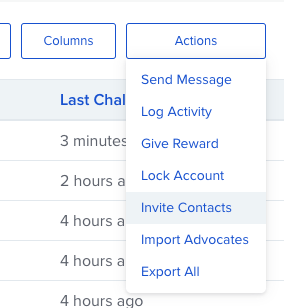 After selecting the Advocates Tab from the Admin tool bar, select Actions which will bring you to a drop down menu, then choose Import Advocates. 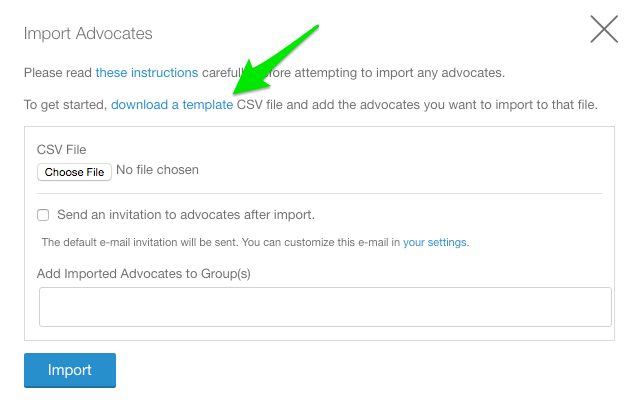 This allows you to import a list of potential advocates in a .CSV file. There is a template of the required format when you click into Import Advocates. The required spreadsheet includes: name, email, company, and title and any match criteria fields that you have. In the window that opens, you can indicate if you would like to add the advocates into specific groups. You can also choose to send and set up an email to the advocates as soon as they have been added. When you're happy with the file and its related details, select Import. All those listed in the CSV file will appear in your advocate list as Not Joined until they login for the first time. For information on how to re-invite advocates who have not joined, see here. There is no limit on the number of advocates that can be uploaded in bulk. However, too many at once increases the possibility of an error - it is best practice to keep the number of advocates below a threshold of 3000 people. 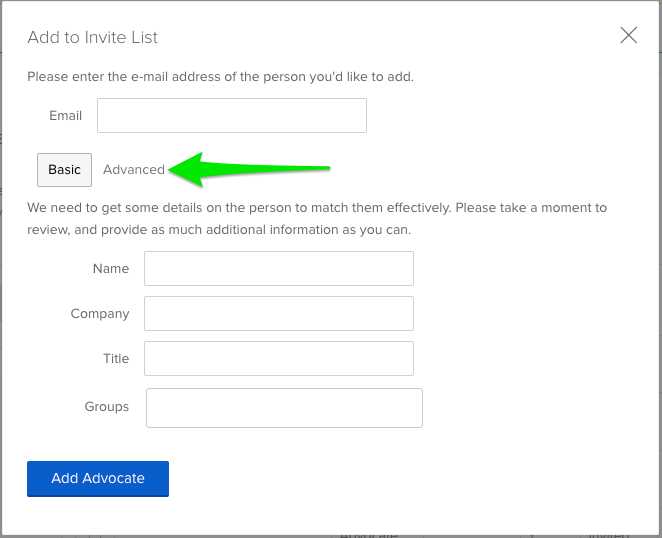 If you can set up your Targeting prior to asking Advocates to join, then you can simply provide them with an invite where you are not choosing to add them to a group(s) upon upload. Once they sign up to the AdvocateHub, any targeting that applies to them will kick in and they will be allocated to the applicable groups automatically. Set the targeting to make this group targeted to anybody who has '@influitive.com' in their email address (Email - Contains - @influitive.com). Another option is to have all your Advocates see a few challenges once they access AdvocateHub. These challenges should be targeted to "Everyone". The challenges might ask an advocate to answer questions, and the answers to these questions can determine which group an advocate is added to. For example, you could have a challenge asking what Geographical region the Advocate is in, whether they are an employee or a partner etc. Then have a group called 'Employee' and anybody who answered with 'Employee' for this question will be added to this group and the appropriate challenges will be unlocked. Is it possible to convert an Advocate Account to an Admin Account?